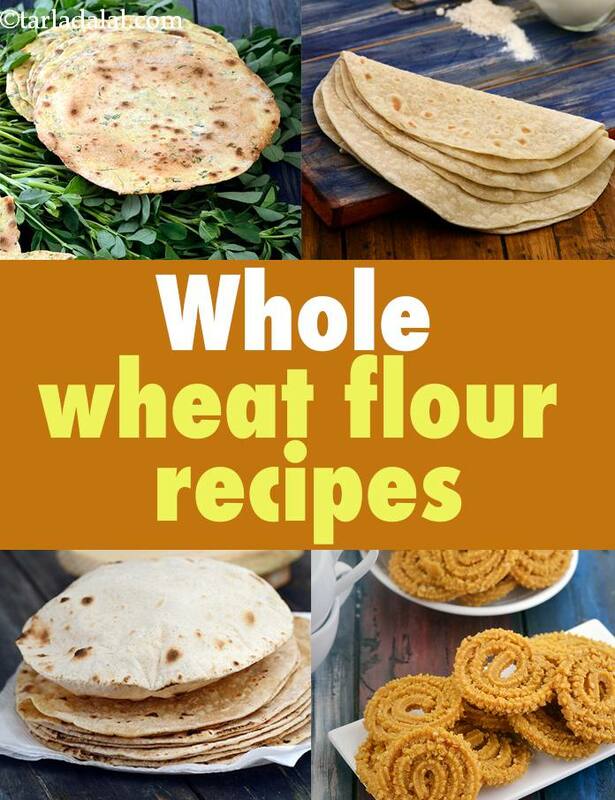 whole wheat flour recipes | Indian Gehun Ka Atta, Wheat Recipes. Roti/Chapatti and parathas are the most popular flatbreads consumed in India. They are nourishing, healthy and filling & generally relished with subzi or accompaniments. India being a diverse country, each region has their own speciality. Phulkas are small, soft flatbreads cooked on a tava smeared with ghee/oil whereas Puri is small, deep-fried flatbread that can be served as a snack or a meal depending on the accompanying items. Masala puri made with whole wheat flour perked up with spices is a popular breakfast in Gujarat. Dudh ki Roti is another variant of the normal roti, its soft texture and the pleasant flavour of milk and ghee is liked by all. Aloo paratha, Gobi paratha are famous breakfast food in Punjab, commonly topped with homemade white butter, served with pickle and a glass of sweet lassi. Delight your kids with these melt-in-the-mouth treats like Cheese paratha or Chocolate cheese paratha. Snacks like chakli, puri, sev that are made using plain flour and deep-fried can be made into healthy dry snacks. The combination of besan and whole wheat flour enhanced with spices to make thin, crispy Ribbon sev is healthy and equally tasty. Made using fibre-rich oats, the Baked Oats Puri is flavoured with sesame seeds, garlic paste and kasuri methi. Multigrain Healthy Cracker, Masala Khakhra, Baked Methi Mathri, Flax Seed Shakarpara are some healthy dry snacks that can be prepared in bulk and stored in air-tight containers and munch on guilt-free whenever hunger strikes. Instant Oats and Whole Wheat Uttapam or Atte ka Chila are surely a quick-fix to your morning breakfast. The batter requires no soaking or fermenting and can be fortified with a good dose of veggies to make it more delicious. Traditional tea-time snack, Bajra Dhebra made with a dough of bajra and whole wheat flour flavoured deliciously with spice powders, green chillies, ginger and garlic is an interesting snack to munch on! Similarly, you can prepare Methi Makai Dhebra, Crispy Whole Wheat Muthia. Most loaves of bread are made using refined flour but, you can always substitute that with wheat flour or multigrain flour which is any day a lot more healthier but might not be as tasty. Laadi pav is feather-soft bun eaten with spicy bhaji or you can also serve it as a sandwich lined with chutney and packed with vada, bhaji , omelette. We have used a quarter cup of plain flour to the eggless dough to give the pav a little elasticity. Upgrade simple bread rolls with a peppy masala of onion, herbs and spice powders, these Whole Wheat Masala Bread Rolls are definitely the perfect accompaniment to a cup of masala chai. We all love bread based dishes, be it pizza, burger or just sandwiches. Most people have become health conscious these days and prefer healthier alternatives over refined flour and that’s when Homemade Whole Wheat Burger Buns, Whole Wheat Pizza Base, Whole Wheat Bread Loaf Using Instant Dry Yeast, Whole Wheat Mexican Tortillas, Lebanese Whole Wheat Pita Bread come to rescue. They can then be transformed into a wide range of dishes with the addition of different vegetables as stuffing/topping. Tortillas/roti made by combining plain flour and gehun ka atta can be made into an array of snacks like Mexican Bhel a fusion of Indian bhel with Mexican flavours, Aloo and Paneer Roll a sumptuous roll with crunchy salad and chatpata stuffing, Corn and Cheese Quesadillas which is sure to strike the right chord with everybody. The use of whole wheat flour is not limited to bread and snacks, it can be transformed into lip-smacking desserts like Golpapdi, Gaund Ke Ladoo, Atta ka Sheera, Puran Poli. Puran Poli is a traditional sweet made in Maharashtrian and Gujarati households, auspicious occasions are surely incomplete without hot puran poli with ghee. While Gujarati’s make it with toovar dal, Maharashtrian’s prefer chana dal. The dal is mildly spaced with aromatic ingredients like saffron and cardamom powder. One of the most popular ways of consuming Gaund that provides the body with heat is to transform them into delicious Gaund ke Ladoos. Atta ka sheera is authentically made in a kadhai by slowly roasting wheat flour but you can also, make it in a microwave quickly in 10 minutes. Soft and chewy Chocolate Chip and Oatmeal Cookie and Whole Wheat Cornflake Cookies will surely pamper your palate! Enjoy our whole wheat flour recipes | Indian Gehun Ka Atta, Wheat Recipes given below.